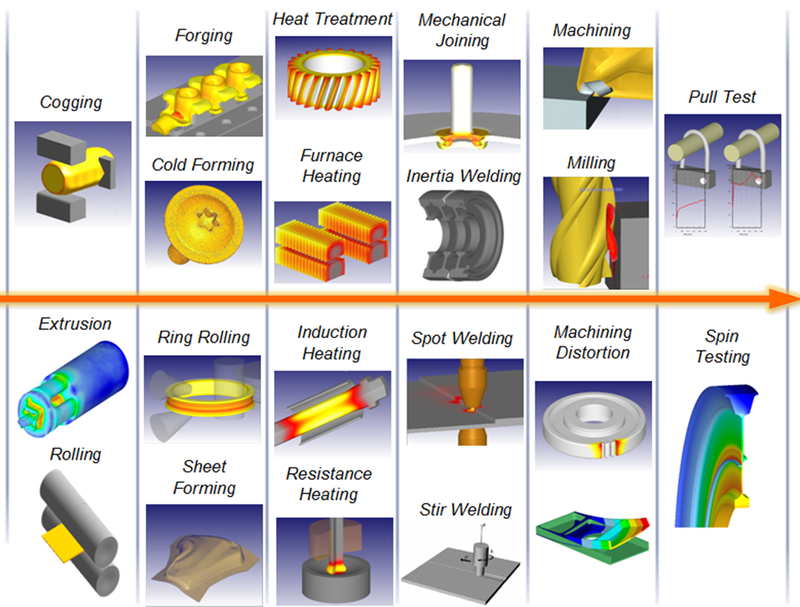 We have tools and experience in coupling design and simulation activities together into a unified workflow. This can involve a number of discrete activities or the complete design and manufacturing process. We have undertaken projects to develop user interfaces and scripts to improve the efficiency of design or manufacturing simulation, coupling discrete operations & models together and simplifying data input & post-processing. There is an increasing need to take into account material properties predicted by a manufacturing simulation within structural models. This can improve the accuracy of the FEA results and also enable companies to optimise their product designs accordingly. Our Advanced Manufacturing software solutions are able to transfer information between models, such as fibre orientations or residual stresses. High integrity, safety critical metal components often undergo multiple forming, heat treatment and machining processes during manufacture. DEFORM is able to integrate these processes while minimising any loss of accuracy of state properties through sophisticated data mapping procedures. Our flexible Optimus system enables CAD, spreadsheet, engineering calculation and design & manufacturing simulation capabilities to be connected quickly via binary or ASCII data transfer, including in-house programs. Once an integrated workflow is created, Design of Experiment (DOE) studies can be easily performed. For power and electro-mechanical systems design, ANSYS Simplorer can simplify multi-domain simulation from detailed components to the system level through reduced-order 1D modelling, all within a single user environment.